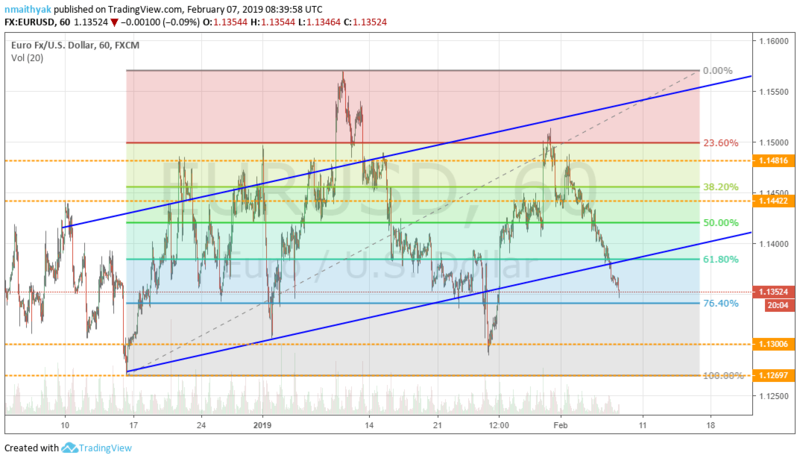 The EUR/USD currency pair has been on a downward movement since the start of February and given the latest news from both the EU and the US, downward pressure seems set to continue for the next few days. The pair traded at around the 1.1350 level on Thursday morning as the Euro continued to experience pressure following another disappointing report from Germany. According to the latest report, German Industrial Production contracted 0.4% MoM in December, thereby missing expectations. Investors will be watching closely to see what ECB Board member Yves Mersch will say when he speaks at the American European Community Association in Brussels. In the intermediate future, traders will be analyzing the market with a bearish view. The recent Q4 GDP for the Eurozone did not impress while the German fundamentals continue to disappoint. And geopolitically, the Brexit continues to take a toll on both the EU and the UK markets. Additionally, PM Theresa May’s EU parliamentary elections are expected to gather pace within the coming days. This will impact the market as investors watch out for a potential advance of populism in the region. The EUR/USD currency pair’s recent decline has created opportunities for both the bulls and the bears. And while the bears will be more optimistic going into the last few days of the week and probably next week, the bulls can also relish the opportunity should a rebound occur. As such, the bears will be targeting profits at around the 1.1300 level for a potential payout of about 50 pips. The intermediate target of 1.1370 is also appealing given the current downward momentum. On the other hand, the bulls will hope for an unexpected rebound. They can begin to target profits at around the 1.1440 level, which is closer to the Fib level 38.2%. This could result in profits of up to 100 pips depending on the timing. Intermediate opportunities also exist with 1.1480 looking a likely target should the EUR/USD pair rally back to this month’s highs. The pair seems to be trading within an upward trending channel, which suggests that a rebound cannot be ruled out, even despite the fact the lower level of that channel has already been breached. When we expand the view using the 4-hour chart, the picture of where things could be heading in the intermediate future becomes clearer. Two channels can be seen forming. 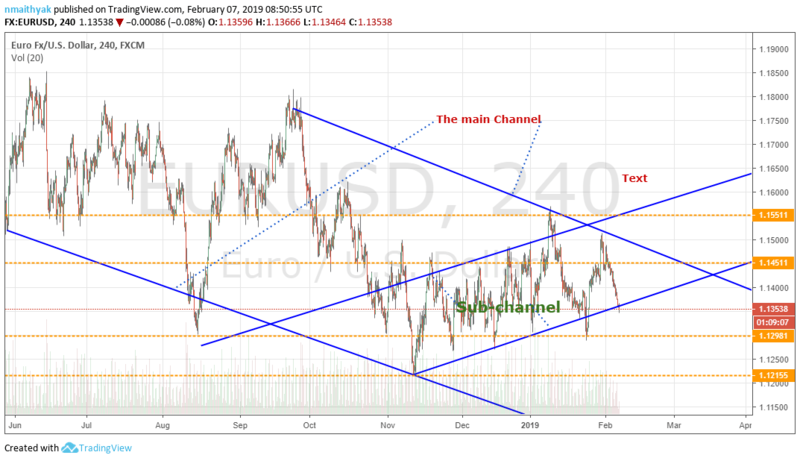 The main channel is bearish while the current sub-channel is bullish. This provides traders with a wider range of options. So, in addition to the short-term trading opportunities presented in the hourly chart, now they get to add a few more using the 4-hourly chart with a longer time frame. As such, the bears will again be looking for opportunities at around the 1.1300 level, but even more profits can be netted should the EUR/USD pair breach the November 2018 low of about 1.1215 as demonstrated on the chart above. The bulls, on the other hand, will be looking at the pair’s ability to rebound off the current upward trending support in the sub-channel. The pair recently touched the lower level of the channel and looking at the previous touch points, a rebound usually follows shortly. So, going for bullish positions won’t be a short in the dark. Realistic opportunities do exist. As such, the bulls will aim for profits at around the 1.1450 level, which has been a key resistance zone over the last three months. And should the upward momentum be strong enough, they could begin to target profits at 1.1551 (YTD high) level for a potential payout of about 200 pips in the long-term. In summary, the EUR/USD currency pair’s general bearish momentum continues to hold, but you cannot rule out an unexpected rebound depending on how things unfold over the next few weeks. Investors will be watching developments in the UK parliament alongside key economic data from both the EU block and the US. As such, while the bears will be more optimistic going into next week (target of 1.1300), the bulls can also point out to the fact that the pair did rally to 1.1551 this year, which means that it could climb back in the foreseeable future.